Rising inequality is increasingly seen as representing a fundamental societal challenge for the rich countries of the OECD, calling into question the sustainability of their long-standing economic and social models. Tony Atkinson’s Inequality: What can be done? (Atkinson 2015) roots the case for tackling inequality in considerations of social justice, but more instrumental concerns are very much to the fore. Rising inequality is seen as undermining growth as well as concentrating its benefits at the top of the distribution, as the incomes of middle and lower-income households stagnate; this in turn is seen as a key driver of political turmoil as voters reject mainstream parties and anti-elite sentiment is rife. This has led the OECD to put ‘inclusive growth’ at the centre of its work, and the managing director of the IMF to conclude that “reducing excessive inequality is not just morally and politically correct, but it is good economics”. While this is supported by OECD and IMF studies of trends in inequality and growth across rich countries (e.g. Cingano 2014, Ostry et al. 2014, Dabla-Norris et al. 2015), the experience of the US undoubtedly plays a central role in in current narratives and debates, as it does in economic research on the drivers and impacts of rising inequality. Income inequality has been increasing in the US since the late 1970s, while wages and incomes for ordinary working households have been remarkably stagnant, despite substantial growth in GDP. This underpins the narrative that globalisation and technological change have been the central forces hollowing out the jobs market, squeezing ‘the middle’, driving up inequality, and undermining growth. This narrative is now frequently taken to apply across the rich countries, but a set of structured country case studies of the US alongside nine other rich countries by country experts (Nolan 2018) highlights just how varied their experiences since the 1980s have actually been. The UK saw overall income inequality rise by as much as the US over this period as a whole, whereas Australia, Canada, Germany, Italy, and the Netherlands saw much lower though still substantial increases, and Belgium, France, and Spain saw little rise in inequality. Increases in inequality were also often concentrated in specific sub-periods, such as the first half of the 1980s for the UK and from 1993 to 2000 in Canada, and so best characterised as episodes rather than consistent trends. Just how important institutions and policy choices have been to these inequality outcomes also becomes more evident when individual country experiences are put under the microscope. To give just a few examples, in Canada redistribution via taxes and transfers offset much of the increase in market income inequality from the early 1980s but not from the mid-1990s. In Spain, market but not disposable income inequality rose in the 1980s as the tax-transfer system became more developed, but it was still relatively ineffective in coping with the severe shock of the Great Recession. In Germany, analysis of the impact of changes in labour and product market regulation and the functioning of wage-setting institutions, as well as in the tax/transfer system, makes clear how much these underpinned the rise in inequality there. Turning to ordinary or typical living standards, trends in earnings and in real household incomes around the middle of the distribution are key indicators of how these are changing. Putting those indicators alongside trends in income inequality shows that the toxic US combination of pronounced, sustained increases in inequality together with long-term stagnation in wages and middle incomes is the exception rather than the rule among rich countries. Despite a similar increase in inequality, the UK saw much higher median income growth than the US since 1980 (albeit not from the mid-2000s). Australia and Canada also had relatively rapid, if again patchy, middle income growth despite a considerable increase in inequality. Germany and Italy had little income growth and increasing inequality from the late 1980s, while the Netherlands had somewhat higher though still modest growth. France combined little increase in inequality and modest income growth, whereas Belgium and Spain saw greater increases in middle incomes over the decades. The relationship between changes in inequality and middle incomes thus varies both across countries and over time and is clearly far from deterministic. This is brought out in Figure 1, which examines the association between real income growth at the middle and trends in income inequality over the past 30 years for the broader set of 18 OECD countries for which such long-term series are available. Overall, the association is weak. Source: Förster and Nolan (2018), Figure 2.5. This does not suggest that inequality and real income growth around and below the middle are unrelated – instead, they are the joint product of a complex mix of underlying driving forces, institutions and policies, and interactions between them. One can point to specific instances where the linkage does appear particularly clear, both temporally and in terms of drivers. In Germany, for example, widening inequality and stagnation in middle incomes were the joint product of reunification and then the deregulation of product markets followed by the Harz reforms. More generally, though, the relationship is variable and contingent. Increasing concentration at the very top may indeed be central to explaining why middle incomes have seen so little growth over decades in the US, but that cannot simply be transposed to other settings. (The same is true of the divergence between growth in GDP per capita and median household incomes, as described in Nolan et al. 2016, 2018). This has fundamental implications for how one thinks about current challenges. Globalisation and technological change are often portrayed as exogenous forces sweeping across the rich countries, inexorably driving up inequality and forcing workers to accept wage stagnation (and often less security) if they are to hold on to their jobs. Instead, the variation in country experiences shows how much institutions and policy responses matter to how these forces – themselves subject to human agency rather than God-given – play out in the job market and affect household disposable incomes. Wage-setting institutions clearly have a critical influence. The Belgian combination of wages indexed to inflation, collective agreements covering most workers, and a high minimum wage underpinned significant wage growth across the distribution. In Australia, the extension of collectively negotiated employment terms and conditions over much of the work force, together with a very high minimum wage, play a key role. By contrast, the remarkably poor earnings performance of the UK over the last decade is in a context where wage bargaining has become individualised. Broader welfare state institutions also play a critical role in levels and patterns of employment. Countries with reasonably strong income growth over recent decades have generally combined some increase in real wages with a rise in the overall employment rate and especially female employment. Recent UK and much longer US experience shows, however, that rising female employment when combined with very weak real wages still equates to stagnating living standards. The welfare state is also key to whether the costs associated with increasing women’s employment are borne by the families themselves or socially, with implications for their welfare generally missed by current metrics. Furthermore, countries have made very different choices with respect to the regulation of employment contracts and conditions, offsetting or accelerating the effects of forces making work more precarious. Country contexts really matter, and policy responses must be framed in light of the institutional point of departure and distinctive challenges each country faces. Promoting economic growth and ensuring that its benefits are transmitted to middle and lower income households need equal attention; redistribution can be strengthened, while wages generated in the market remain fundamental. The current political salience of inequality and stagnation provides a window of opportunity for a fundamental reassessment of how growth and prosperity are being pursued; the US experience should not however dominate in the search for explanations and effective responses. Atkinson, A (2015), Inequality. What can be done?, Harvard University Press. Cingano, F (2014), “Trends in Income Inequality and its Impact on Economic Growth,” OECD Social, Employment and Migration Working Paper No.163. Dabla-Norris, E, K Kochhar, F Ricka, N Suphaphiphat and E Tsounta (2015), Causes and Consequences of Income Inequality: A Global Perspective, IMF. Förster, M and B Nolan (2018), “Inequality and Living Standards: Key Trends and Drivers”, in B Nolan (ed. ), Inequality and Inclusive Growth in Rich Countries: Shared Challenges and Contrasting Fortunes, Oxford University Press. Nolan, B (ed.) (2018), Inequality and Inclusive Growth in Rich Countries: Shared Challenges and Contrasting Fortunes, Oxford University Press. Nolan, B, M Roser and S Thewissen(2016), “Stagnating median incomes despite economic growth: Explaining the divergence in 27 OECD countries”, VoxEU.org,27 August. Nolan, B, M Roser and S Thewissen(2018), “GDP Per Capita Versus Median Household Income: What Gives Rise to the Divergence Over Time and How Does This Vary Across OECD Countries?”, Review of Income and Wealth. 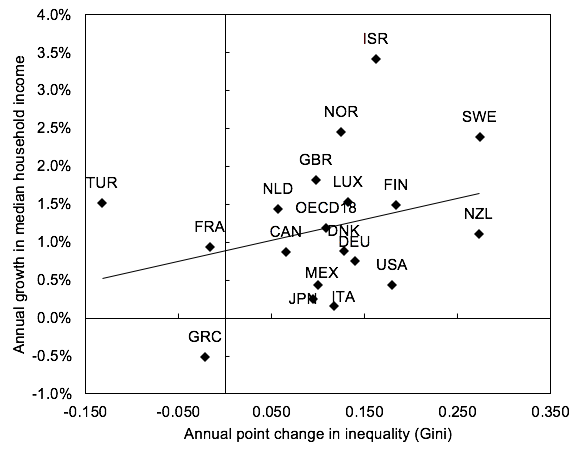 OECD (2015), In It Together: Why Less Inequality Benefits All, OECD. Ostry, J D, A Berg, and C G Tsangarides, (2014), “Redistribution, Inequality, and Growth,” IMF Staff Discussion Note SDN/14/02.